This paper aims to look at the variation of network structure within a metropolitan area and relate it to observed travel, measured here as the average travel time to work. The Minor Civil Divisions (MCD) within the Twin Cities (Minneapolis, St. Paul) metropolitan area are chosen for this analysis. Quantitative measures, compiled from various sources, are used to capture the various aspects of network structure within each MCD. 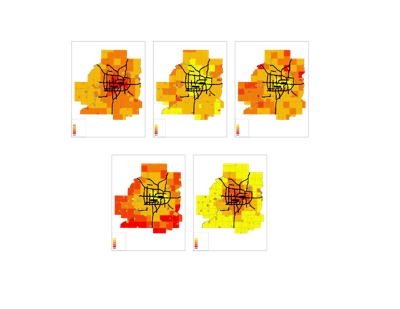 The variation of these measures within the metropolitan area is analyzed using spatial analyses. The measures of network structure are then related to observed travel using statistical regression models. The results confirm a relation between network structure and travel and point to the importance of understanding the underlying street network structure.